The Orchestra, conducted by Maestro Costantino Carollo, a combination of great performance and great quality, boasts a presence of well over 60 artists, including orchestra professors, vocalists, body of dance, director and collaborators. The Ensemble is made up exclusively of professional singers and musicians, who have a rich series of soloist experiences and in well-known orchestras. 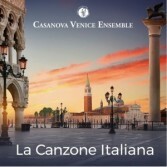 The new album of the ensemble that has taken the place of Rondò Veneziano is a collection of some of the most beautiful Italian songs of all time: from "'O sole mio" and "Volare" to "Acqua e sale", covering an historical period of over 50 years. The "guest star" of this project is Chiara Luppi, already a voice in the colossal of Riccardo Cocciante "Romeo and Juliet", finalist in Sanremo young and "The Voice of Italy" with Raffaella Carrà.